Next To You. Ahead Of Technology. 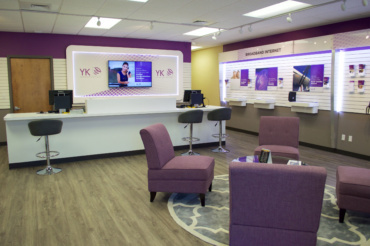 At YK Communications, our first goal is to make sure your experience is second to none. We’re a local provider of residential and business-class Broadband Internet, Voice, Video and Security services in South Texas, and our technology is making a big difference in the small communities we serve. Our Core Values are based on a deep commitment to the neighbors beside us and the innovations in front of us. As a family-owned business — the “Y” stands for Young and the “K” for Kacer — YK Communications has for generations been dedicated to building strong connections. What began in 1948 as Ganado Telephone Company has evolved along with technology to become your go-to resource for a broad range of communications solutions. YK Communications now offers both traditional and cloud-based/managed services to meet the growing needs of homes and businesses. Based on customer feedback, our services are regarded as superior to those offered by other area providers — faster internet speeds, better reliability, and higher quality equipment. Our customers also tell us they appreciate the responsive customer care they receive from YK Communications. Because of our local support, families can get their questions answered quickly, and owners and managers can focus on running the business rather than troubleshooting the technology. A key chapter in the YK Communications story is our investment in fiber installation starting in the 1990s, since our fiber network makes it possible for us to deliver services our company’s founders could not have even imagined. This network serves the communities of Ganado, Louise, Markham, and El Campo, and uses 100 percent underground construction to create an essentially stormproof infrastructure for unmatched reliability. Why make this fiber investment? Because YK Communications understands how vitally important broadband services are to virtually every aspect of your daily life. YK Communications is grateful to all who have been part of our story so far, and we look forward to exploring the next chapter with you. Live in the El Campo, TX area? Become a backer of our latest fiber project!